Over the past two years, there has been essentially no “risk premium” in oil prices due to a supply glut and large inventories. That could change if tensions in the Middle East turn into wider conflict. With oil supply and demand in balance, even small disruptions to supply or transportation could disrupt inventory enough to drive oil prices higher. ‘commodity risk premiums’ can be defined as returns that speculators expect to receive as compensation for taking another party’s natural exposure to fluctuations in commodity prices through buying or selling a commodity futures contract. For example, suppose the spot price of oil is $50 per barrel today, and the market expects the spot price to be $60 in one year’s time. If the futures price is equal to $57, then the risk premium speculators expect to receive for balancing the market and assuming the future spot price risk is $3. 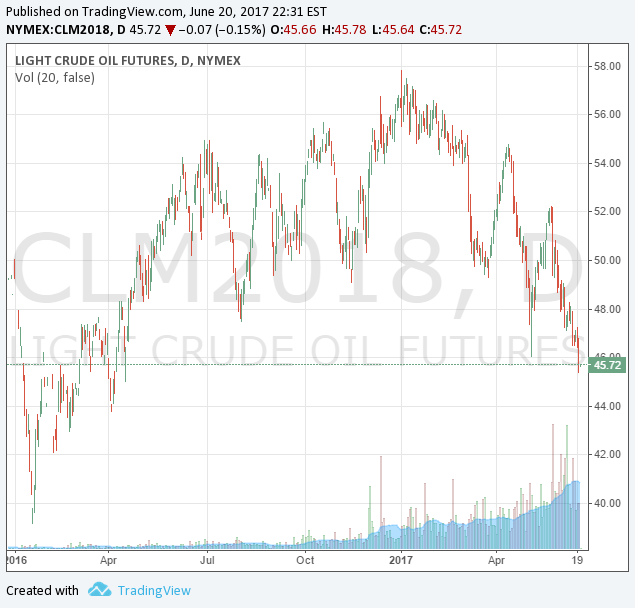 Currently, the future’s price of oil exceeds the expected future spot price of oil, a condition called “contango.” This implies the risk is that oil prices will fall further and that there is essentially no risk premium for future oil delivery. The market is saying that the current oil glut will last at least another year and that the cost of storage is a bigger risk than the potential costs of finding oil to deliver. In addition, as you can see, the spot price and the futures price (June 2018) have been falling precipitously for months now. This demonstrates an extremely bearish sentiment towards oil prices. With the market believing that oil will remain in a glut at least another year, I think it is important to ask these questions: What if the market is not taking into account all factors? What if today’s supply and demand, as well as inventory, are being considered within a vacuum of pure price speculation independent of consideration for potential supply disruptions?